My mother got this recipe from somewhere forgotten (possibly the Toronto Star, she gets a lot of surprisingly great recipes from there), and makes it regularly now for its humble deliciousness. 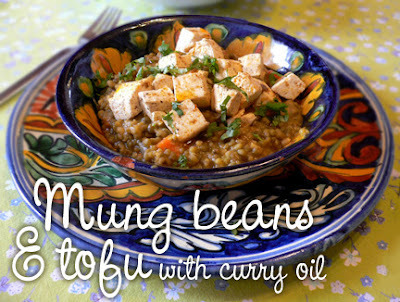 Mung bean tastes like a mild, creamy lentil. Put 1/2 cup oil and curry paste in small jar. Cover and shake 1 minute to blend well. Let sit 4 hours or overnight in fridge, allowing oil to separate from paste. Transfer rinsed beans to a large pan. Cover with water. Bring to boil over high heat. Reduce heat to medium and cook 10 minutes. Drain. Heat remaining 1 tablespoon oil in pot on medium heat. Cook carrot, celery, shallots (or onions) and garlic 1 minute until translucent. Stir in curry powder, cumin and saffron. Cook 1 minute. Add beans, stock and 1 cup of water. Turn heat to high and bring to boil. Reduce heat to medium. Cook 20 to 30 minutes, until beans are soft but still hold their shape and water is absorbed. Stir in tomato paste if using, and season with salt and pepper. In medium bowl, sprinkle tofu with salt and pepper. Carefully pour 2 tablespoons of curry-infused oil from top of jar into medium, non-stick skillet on high heat. Fry tofu 5 minutes, turning gently, until golden. Place beans on serving platter or individual pasta bowls. Top with tofu. Drizzle beans with remaining infused oil and sprinkle cilantro on top. (You can top up the curry with more oil for future uses if you like.) Serves 4. For a spicy stew, use a spicy curry powder and curry paste in the recipe. I had some leftovers and had it topped up with water to make a thick soup, and stirred in some spinach leaves which wilt in the heat. A dash of Bragg (or tamari), and it was delicious!